Processed naturally without additives, Crema Mexicana Natural is a smooth, rich, nutty cream developed from slow culturing. Its balance cultured cream flavor is great for making mouth-watering desserts or as a topping to strawberries, bananas, and many other fruits. Los Altos Mexican Cream is packed with the best refrigeration materials to keep them cold & fresh during shipping delivery process so they will arrive at your door step ready to eat, or further refrigeration or freezing (it may vary on some items). We only ship Mexican Cream from Monday thru Wednesday so they don't travel during weekends. We are sorry but we cannot ship refrigerated orders to: APO, FPO, Etc, as well as Puerto Rico and Canada. All sales are final on this item and no returns are accepted. 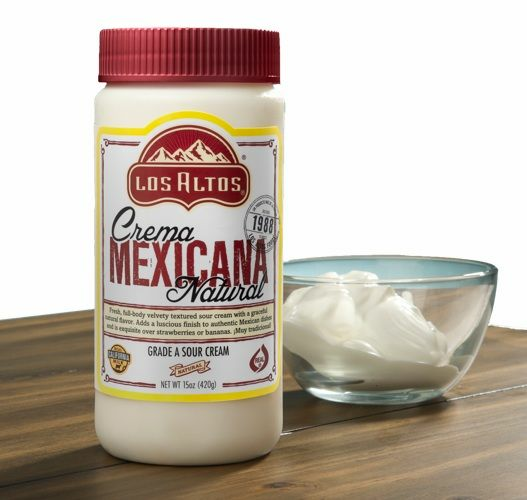 La crema mexicana marca Los Altos es una crema procesada de forma natural.Los Altos Foods fue la primera empresa en introducirla a los Estados Unidos, solamente se utiliza crema pasteurizada de grado "A" sin ning�n conservador o estabilizador artificial. La consistencia es rica y cremosa. Pru�bela en tacos, tostadas, burritos, enchiladas, o en cualquier otro platillo mexicano. Tambi�n es deliciosa en postres como fresas, pl�tanos o con cualquier otra fruta. La Cremas Mexicanas Los Altos las empacamos en MexGrocer.com con los materiales necesarios para que se conserven frias durante su traslado y lleguen a tu puerta listas para comer, refrigerar o congelar. Disfruta en tu casa o restaurante la calidad y sabor �nico de la aut�ntica crema Mexicana. What a great Mexican Cream. We love this product. So many things it can be used with. If you haven't try this-do. Nothing can top this topping! I've tried all sorts of creams on my desserts, but nothing worked like this crema did. The flavor is really good and balanced. I use it bananas, strawberries and canned peaches. I also top fried plantains with it and it is really a special treat. ProsSmooth texture, not gummy. Mild flavor, doesn't overpower what you are serving. A scoop of this cream over strawberries transports me to one of my favorite childhood treats: fresas con crema. Is great to have this type of cream now available on-line, I've been buying it from the store in LA, but I have family in other parts of the US that crave it but up until now it was hard to get there. Best sour cream in the market, because is truly real, fresh and 100% natural. Pros100% natural Incredibly fresh, Authentic flavor.